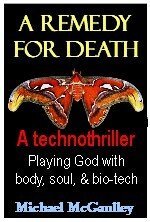 Slowed aging is becoming the "new normal"
My medical-techno thriller, The Life After Life Conspiracy, is about how some will go to unethical lengths to get another shot at youth--- by slowing the aging process, but even more by using today's emerging technologies as a potential tool toward eternal youth, if not renewed life. The article, by Janice Lloyd, focuses on Janet Evans, a four-time Olympic gold medalist swimmer,soon to be 40, who is working toward a comeback after being retired 15 years. Most people, whether they're weekend warriors or professional athletes, peak in their 20s and early 30s. Then they start to lose muscle, the body begins to slow down — and regenerating muscle and healing from strenuous workouts take longer. ""People will say, 'I can't seem to push as hard as I used to,'" says sports medicine physician Mary Otis. "It's like, 'What's this? What's going on?' Most people start to notice it in their mid-30s." "What's going on are changes programmed into our DNA, Otis says. Muscular performances decrease because of the loss of elasticity in blood vessels, heart muscle and lung tissue. There is decreased maximum heart rate, decreased amount of blood pumped with each beat and thus, a decreased cardiac output. "But decades of research, Joyner says, show there are good reasons to stick it out even when it gets harder. Active people age more slowly. Studies, begun by A.V. Hill at Harvard in the 1920s, show how an athlete with high aerobic capacity outperforms others. "Later studies show strenuous exercise could be an age preserver. For instance, a 1990 study comparing masters athletes and sedentary people shows the decrease in maximal aerobic capacity in people who continue to engage in regular vigorous exercise training is one-half the rate of decline seen among the sedentary subjects." Exercise--- a real and ethical age-extender. Regenerative medical technology, used wrongly --- not ethical, but nonetheless an intriguing plot device for my The Life After Life Conspiracy.